"Joshua was from a feral colony and at first was quite skittish (hiding under the bed all the time), but now he's a real "momma's boy" very loving and loves to play ALL the time! He wags his tail like a dog, and loves to pounce on everything. Lily's favorite pastime is eating (even with bad teeth from an autoimmune disease that causes her gums to be inflamed), but she also likes to chase a hand-held laser pen. 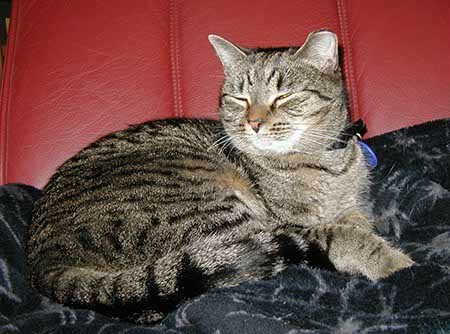 "Both cats love to sleep on the bed at night with us, making it very difficult to turn over during the night, and Lily starts demanding breakfast at about 5:00 am (even on weekends). Nothing more startling than opening your eyes to see big dark eyes staring back at you from a few inches away!" 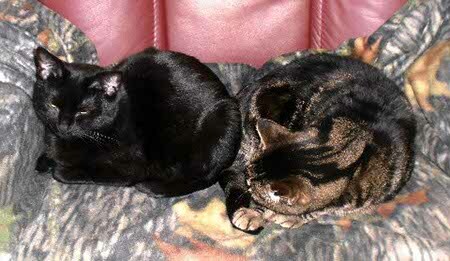 Salli writes, "Ward (the brown tabby) and Lucy (black) were about 3 when I adopted them in Jan. 2011. They had not met and it has taken about a year for them to really become close -- I will admit that the power outage for multiple days in Oct. seemed to help as we all "cuddled" at night! This picture is the first time they shared "my" chair -- needless to say, I do not get to sit in it often." 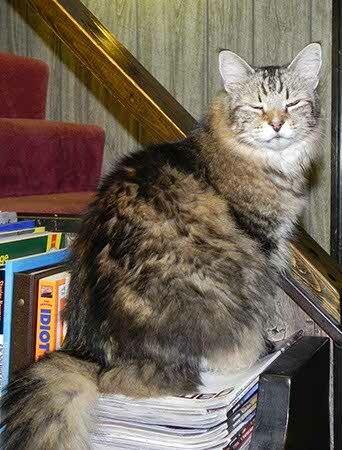 The Fuller Family writes, "We adopted Newman from Kitty Angels almost three years ago after the loss of our 20 yr. old cat , Beau . Newman has fit in "puuurrfectly" w/ our family! He is an absolute love and King of the castle! Our two teen sons refer to him as "cat-dog ". He loves to play and rough -house w/ them but certainly takes his share of cat-naps !He's loved and pampered! He brings so much joy and happiness to our family! We can't imagine life without him!! We hope other Kitty Angels cats find loving homes, especially during this Holiday season! "Thank you to all the volunteers at Kitty Angels - you truly are angels!" Colleen and Frank write, "Angel was adopted in March 2010 and Mojo (Mojito) in April 2011. Angel is 'mostly' living up to her namesake & MoJo is a little devil- still running all over and talking up a storm. They get along wonderfully. He chases her all over the place & then she hides under the bed when she has had enough. But don't get me wrong, if he's not paying attn to her - she will aggrevate him to be sure he will. (-; Great Buddies for sure!" Andrea writes, " Today is the 4th anniversary of when I adopted "Sly/Adam" and re-named him "Koogah." I think Koogah is about 7 years old now. 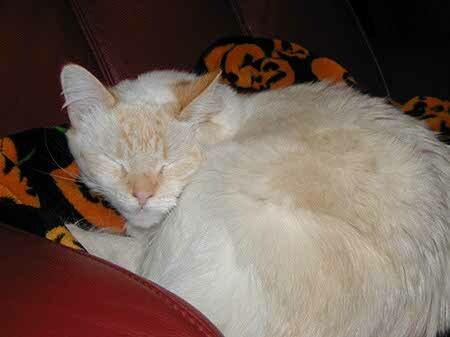 He is a wonderful cat and I am grateful to Kitty Angels for sheltering him and trusting me to adopt him. 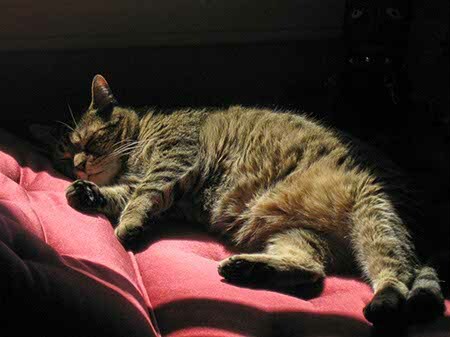 In the photo attached he is enjoying a nap in the sun. Koogah surprises me each day, in that he doesn't have a typical 'routine' and he seems to always be trying new things-- finding new favorite spots to nap and new toys to play with-- so funny. Koogah gets along with my landlord's cats who live upstairs, and Koogah enjoyed a summer visit to my parents' house on the Cape... he enjoyed their floor-to-ceiling sliding glass doors to watch the chipmunks, squirrels, and rabbits in the yard. Koogah is one of those cats who has some dog-like qualities: he always greets people at the door and is quite social and flexible. What a great cat! "Many thanks to Kitty Angels and to the foster family! Koogah says hello!" Jenn writes with an update on Timberwind, "He is getting up there in age, but he is still active and looking good! I attached a picture of him. My husband Joe and I were lucky to find him! He has moved from Tewksbury, MA to Londonderry, NH and now we are back in Tewksbury. Great Personality! 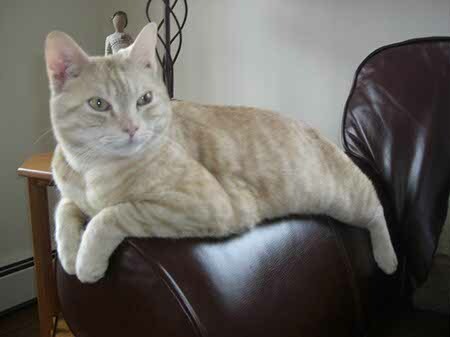 Who knew Timberwind would come this far... Scared and timid to a highly intelligent, affectionate cat! All it takes is dedicated time and love, plus a chance to adapt to their new home. "